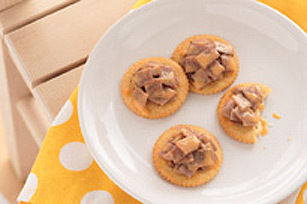 Cheese and crackers just got a lot more interesting - RITZ Crackers topped with roast beef and melted CHEEZ WHIZ makes a quick snack for one. For a quick appetizer, multiply the ingredients to serve a crowd. Place meat in small microwaveable bowl; top with Cheez Whiz. Cover bowl with paper towel. Microwave on HIGH 15 sec. ; stir well until meat is evenly coated. Substitute shaved turkey or ham for the roast beef.